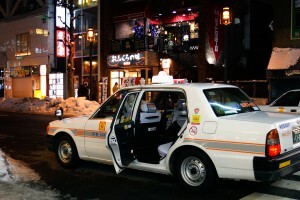 Automatic Door of the Taxi - Here, we update the latest information from Japan!! This taxi has a typical function in Japan, which all the tourists from overseas are amazed at, when they first come to Japan. It’s that the door of the back seat opens automatically when the customer approaches, and closes when he/she gets on. Actually, it’s not automatic, since the drivers have to pull the lever next to his seat to do that. But since the drivers do that very naturally, the tourists seem to be amazed, especially for foreign people who use the taxi for the first time in Japan. Even though we, Japanese people, take for granted this service, I think it might be making Japan the country where they can naturally offer people ‘hospitality’. Why don’t you get in a Japanese taxi and feel the hospitality, even for a short distance when you visit here?